Singapore knows what it wants to push for as it takes over from the Philippines as chairman of Asean this year. Bundled under the tagline "Resilient and Innovative", its plethora of plans include Asean working together to get tough on terrorism, cybercrime and become more resilient in the face of climate change, said Prime Minister Lee Hsien Loong in a speech on Friday at an Asean chairmanship launch event. He added that Singapore also wants to promote schemes that will help Asean's economies innovate and use technology. Foreign Minister Vivian Balakrishnan also said in a lecture titled Asean: Next 50 last year that as chairman, Singapore wants to connect the region's people and economies more seamlessly through digital technology, and to deepen the bloc's ties with outside powers like China and India. Singapore is also gunning for the Regional Comprehensive Economic Partnership (RCEP), an ambitious trade pact in the works that will cover half the world's population if successful. At every Asean-related public event this year, Singapore's leaders have championed the importance of open borders and cooperation over insularity and distrust. But even the most meticulous plans can get sidelined by crises like the humanitarian disaster and mass exodus of refugees in Myanmar's Rakhine state. Singapore will also have its hands full in seeking to maintain Asean's unity and central role in the region, given disagreements between members and the possibility of some being swayed by big powers. Insight takes an unvarnished look at the key challenges ahead for the regional grouping this year. There could be a problematic member of the Asean family on any given issue, but we never point fingers directly. That allows that member to climb down from a confrontation with the rest of Asean. ASSOCIATE PROFESSOR ALAN CHONG of the S. Rajaratnam School of International Studies, on the need for Asean's non-confrontational style. Since August last year, more than 650,000 minority Rohingya Muslims have fled Myanmar amid violence and a military campaign in Rakhine. The crisis also produced one of Asean's most public disagreements: Malaysia dissociating itself from a statement made by the Asean chair at the United Nations General Assembly last September. Malaysia said the statement "misrepresented the reality of the situation" of the ethnic Rohingya in Myanmar, and called on Myanmar to stop atrocities which "unleashed a full-scale humanitarian crisis". Dr Termsak Chalermpalanupap, a research fellow at the ISEAS - Yusof Ishak Institute, says it will be difficult for Asean to come to a consensus on the Rohingya issue. "Myanmar wouldn't even let Asean mention the term 'Rohingya' in any formal Asean statement," says Dr Termsak, who was with the Asean Secretariat in Jakarta from 1993 to 2012. "Malaysia and Indonesia have domestic reasons to take a tough stand on the Rohingya issue," he adds, alluding to how both countries have large Muslim populations critical of the violence against the Rohingya Muslims. Despite these competing interests, Singapore as chairman is likely to go all out to get a statement of consensus, Ambassador-at-Large Ong Keng Yong tells Insight. The former secretary-general of Asean from 2003 to 2007 says of Malaysia's dissociation from the statement: "In the history of Asean, there were only a few times it has happened... In the past few years, we all tried to avoid this. "As chairman, Singapore will always like to make sure that everybody comes together and agrees on something." He adds: "It's true that sometimes, the agreed text will be very watered down. But the overriding consideration for Singapore is that everyone remains at the table." Asean has also long been criticised for not taking a tougher stance on human rights issues, but Associate Professor Alan Chong of the S. Rajaratnam School of International Studies argues that this non-confrontational style is needed to stop the grouping from breaking up. "Everyone has skeletons in his closet. We can't go into that level of openness. History is a living ghost haunting Asean," says Dr Chong. "There could be a problematic member of the Asean family on any given issue, but we never point fingers directly. That allows that member to climb down from a confrontation with the rest of Asean." This, he says, is likely to be played out in the case of Myanmar. Singapore will have to juggle competing interests when it comes to Asean's development as an economic community. "Every time Singapore was in the chair, we delivered on a few ambitious things. In the past, (this was) mostly to do with economic integration," says Mr Ong, citing the Asean free trade area agreement signed in 1992 and the Asean Economic Community blueprint adopted in 2007. "Most of the other Asean member-states would like to say that they give Singapore a long leash to do some of these initiatives because most of these are beneficial to the rest of Asean." Most of Asean does not object to the logic of economic integration which Singapore, Malaysia and Thailand are championing, he says. "We're saying that our Asean market is very attractive, people are coming to put money here... but we must get a quid pro quo. If you want to invest and trade in the Asean region, we must also be able to reach your market," he adds. "The way to do that better in Asean is to integrate the 10 economies, instead of external countries negotiating one by one with all 10." If successful, such integration has a good chance of delivering economic growth that can keep South-east Asia's growing middle-class happy, say experts. Says Dr Chong: "Everyone is looking out for economic growth and that's one way of keeping every country stable. Once the pie grows, the pressures that make people unhappy and protest will be reduced." He adds: "If you look at each individual Asean economy, there's a good chance that each will not be able to produce solid, sustained economic growth without the advantages of a collective market." He cites how multinational corporations tend to want to position their factories or headquarters close to the Asean economy. Singapore plans to make it easier for companies to do business across the region. Among its announced schemes is the Asean Single Window, a digital platform that will clear cargo and release shipments more speedily. It will also work on an Asean-wide self-certification regime that will let authorised exporters themselves certify that their goods meet Asean's requirements for preferential treatment. Singapore is also one of Asean's most vocal champions of the RCEP, the trade pact involving Asean and six of its key trading partners, including China, India and Japan. So far, negotiations have been slow, says Dr Termsak. Since they were launched in November 2012, only two chapters on economic and technical cooperation and on support for small and medium-sized companies have been concluded - out of the 18 chapters listed in the approved outline. "The RCEP involves so many powers outside Asean that Singapore will have to play an ultimate balancing act," says Dr Chong. Singapore usually plays a support role to traditional free trade proponents like the United States, Canada and Australia, he says. "But this time, given the nature of the Trump administration's attitude towards free trade, Singapore is actually taking upon itself a very unusual challenge to organise collaboration," he adds. This also means there is only so much Singapore can do if larger countries decide not to play ball. On the bright side, experts generally agree that the disputed waters of the South China Sea are calmer these days. ISEAS - Yusof Ishak Institute senior fellow Malcolm Cook says: "Unless China takes new, very aggressive actions in the disputed waters of the South China Sea, I doubt it will become a source of high tensions between Asean and China." However, Asean still has a mammoth task ahead: negotiating with China a Code of Conduct (COC) on the South China Sea, due to start early this year. Experts note that getting to this point from the 2002 Declaration on the Conduct of Parties in the South China Sea took almost 15 years. The ball is in China's court, says Dr Cook, adding: "Chinese reservations have been the main reason it has taken almost two decades." Asean will be looking at three aspects of the COC, says Mr Ong. First, whether the document can be legally binding, and second, whether it can be more explicit in what countries can or cannot do on environmental issues like pollution and overfishing. But the trickiest item is to better define the exact waters that the code will cover, as this cuts to the competing territorial claims at the heart of the dispute. Any discussion about how much the code will cover must address China's claim of nearly 80 per cent of the sea using its nine-dash line, says Mr Ong. "If China does not claim 80 per cent, that can be a starting point... But how are we going to get there? No one knows. Because the Chinese military has said, we are not going to give up one inch of our motherland," adds the diplomat. The COC also needs to be written in a way that allows other powers like America, Japan, India and Australia to maintain their presence in the region, he adds. Although Singapore holds the position that it believes in a rules-based regime, including freedom of navigation in the South China Sea, even this is difficult to codify. "Right now, every time Singapore says it subscribes to a rules-based order, the Chinese will be upset. They always say, 'When you say that, it means you're supporting America.' 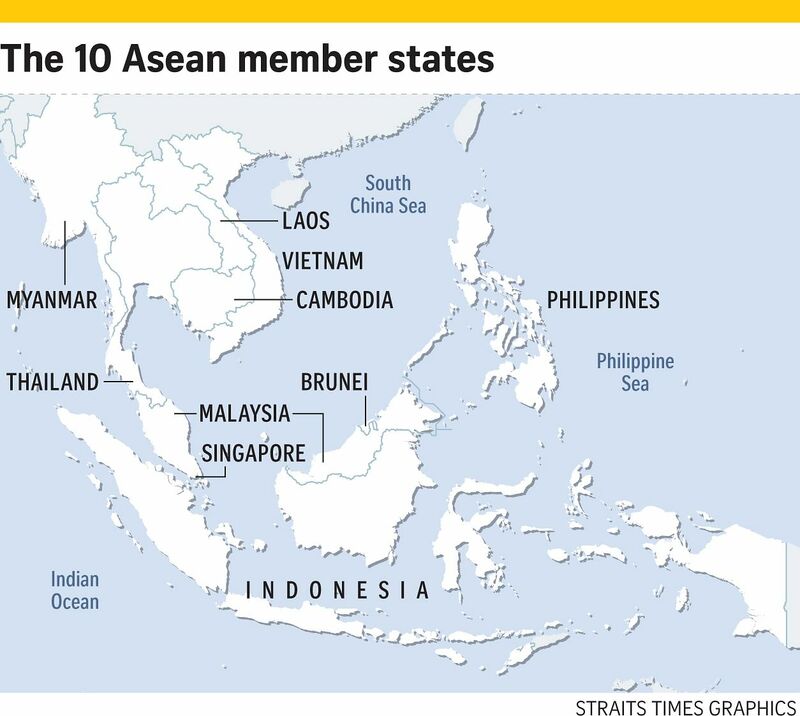 These are the areas the COC's negotiators will have to deliberate over," says Mr Ong. Complicating matters, certain Asean members are cosier with China than others would like. In 2016, Cambodia twice scuppered an Asean consensus by blocking the group from mentioning the arbitration ruling that roundly dismissed Beijing's claims to the South China Sea as having no legal basis. Says South China Sea expert Ian Storey of the ISEAS - Yusof Ishak Institute: "As Prime Minister Hun Sen turns his country into a one-party state, he will become increasingly estranged from the West and pull even closer into China's orbit. "Greater dependence on China means that Cambodia will continue to do Beijing's bidding within Asean, including making sure that the COC has no teeth." Even the Philippines has warmed significantly to China due to the change of government from the Aquino administration which took China to court over the South China Sea in 2013, to the Duterte administration in June 2016. "President (Rodrigo) Duterte has prioritised better economic and diplomatic relations with China over the maritime rights and territorial disputes between China and the Philippines," says Dr Cook. This was reflected in the "softer Asean language on the South China Sea" last year with the Philippines under the Duterte administration as Asean's chair, he adds. These worries lay bare a key challenge of Asean: maintaining its unity amid superpower influence. Asean leaders voice concerns that if countries are swayed, the bloc will be unable to speak with one voice and will lose its power and position on the world's stage. Such obstacles will come up, but are often mitigated by Asean's very dynamics, says Dr Chong. "This is the art of intra-Asean diplomacy: You know how certain countries are aligned, but you don't call them out because you want to preserve this thing called the Asean consensus," he adds. The goal is to keep Cambodia sufficiently interested in an internal consensus among Asean states so that it will not completely do China's bidding. "Cambodia will have to assess the extent to which itshould pursue a slightly more independent foreign policy while still tilting towards China - a fine balancing act most Asean states do," says Dr Chong. "You are usually a closer friend to some great power, but at the same time you want Asean to be useful because you won't want the great power to lean too heavily on you," he adds. "This is playing the Asean card. Asean has its internal dynamics to be used very skilfully by each member state to fend off the great powers." In any case, the onus of reaching consensus rests on all Asean states and not just on Singapore as chairman, says Dr Tang Siew Mun, who heads the Asean Studies Centre at the ISEAS - Yusof Ishak Institute. "The failure to reach a consensus should not be seen as a reflection of Singapore's weakness. Instead, it should be viewed as what it actually is: intractable disagreement within Asean," he adds. But Dr Termsak is more upbeat about Asean having a way of ironing itself out, saying: "Don't worry too much about disagreement in Asean. We have to go at it the Asean way: Emphasise the positive, think constructive and try to overcome problems." For Singapore, its interest is to continue the momentum. Says Mr Ong: "We may not get very concrete, fast results, but the bus must not stop. We all got on the bus and agreed to the Code of Conduct. So the bus must continue driving, maybe in first or second gear, never mind, we don't expect it to be in fourth gear. But all of us got on the bus and it's still moving."